The administrative processes and timelines the Council will follow to establish ABCs, ACLs and AMs. The five-tiered system of ABC control rules looks at different levels of scientific information to be considered when calculating ABC. The control rules are organized from data rich down to data poor, with Tier 1 being the highest (data rich) and Tier 5 being the lowest (data poor). Tiers 1-2 involve data rich to data moderate situations and include levels of uncertainty derived from model-based stock assessments. Tiers 3-5 involve data poor situations and include levels of uncertainty derived from ad-hoc procedures including simulation models or expert opinion. When calculating an ABC for a stock or stock complex, the SSC must first evaluate the information available for the stock and assign the stock or stock complex into one of the five tiers. 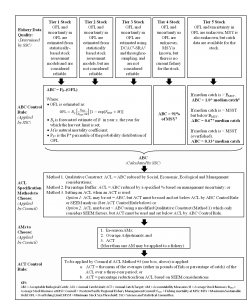 The SSC must then apply the control rule assigned to that tier to determine the ABC. The SSC may recommend an ABC that differs from the result of the control rule calculation based on factors such as data uncertainty, recruitment variability, declining trends in population variables, and other factors determined relevant by the SSC, but must explain their rationale. The tiered system of control rules are graphically illustrated below. The Council developed a process by which the risk of overfishing can be reduced from the 50% maximum P*. 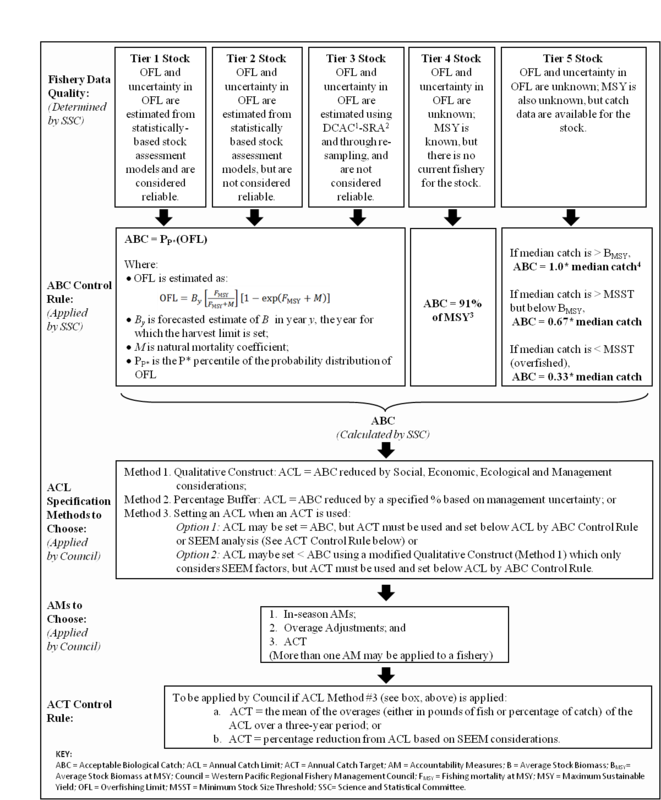 This approach, based on the approach developed by the South Atlantic FMC, is a qualitative method of determining P* that considers the amount of information available on the stock or stock complex, including scientific uncertainty, for the following dimensions: 1) assessment information, 2) assessment uncertainty, 3) stock status, and 4) productivity and susceptibility. Information on the four dimensions will be complied and analyzed by a team that may include Council and SSC members, Council staff, and other individuals knowledgeable in the fishery, including stock assessment experts. Team members will use their knowledge and expertise to assign a single score for each criteria under each dimension. The maximum value for each dimension is 10 and the sum of the four dimensions has a maximum value of 50. The scores for each dimension will be added together for a final score, then be reduced from the maximum risk of overfishing (P*MAX) of 50. The ACL qualitative construct uses an approach similar to the P* qualitative construct. While the P* qualitative construct considers the amount of biological information (scientific uncertainty) available on the stock or stock complex, the ACL qualitative construct considers the amount of socio-economic information (management uncertainty) on the fishery that targets the stock or stock complex. Specifically, the dimensions that will be used for the ACL qualitative construct would include the following factors: 1) Social; 2) Economic; 3) Ecological; and 4) Management uncertainty (SEEM). Aspects of the SEEM dimensions could include the importance of the fishery both socially and economically; consideration of the ecological importance of the stock or stock complex targeted by the fishery (e.g., is the stock a key indicator species of ecological health of the ocean), and whether managers can effectively constrain catch to planned levels. Like the P* qualitative construct, the scores for each dimension will be added together so that the total score is subtracted from a default value of 100% ABC (i.e., 100).